Last month I had the privilege of attending a Diversity and Inclusion event run in partnership by PwC and Global Women. The event was run by Senior PwC Partner, Russell Windsor. Russell led by example, showing vulnerability as he shared his story of how he came to bringing his “whole self to work” and the challenge of doing so. Within the corporate world, we are focused on Diversity – spending effort on how to ensure we do enough to ‘tick all the boxes’- but how can we truly be inclusive? Why ‘be diverse’ if we do not ensure we have an inclusive environment where everyone’s voice is valued? 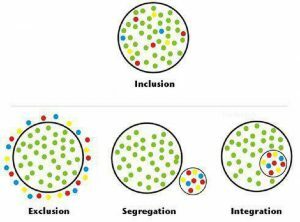 Shannon recently shared an image (below) which communicates the difference between different kinds of diversity and inclusion so well! Diversity and inclusion are good for everyone, not only those groups who are perceived to be marginalised. The International Women’s Day 2019 hashtag is #balanceforbetter, where a balanced world is a better world. It is our responsibility as corporates and those of privilege to share stories, to continue to raise awareness, to be role models. Statistics such as youth suicide rates show that we will have a long way to go. I have a position of relative privilege – I come from a hardworking but well off family, I am well educated, my body is ‘full-able’ and I am white. Although I may not represent marginalised groups, I will continue to share stories, attempt to spark thought and use my privilege to advocate. What will you do differently to move the dial?